On Friday, January 12th, school board candidate Elijah Manley was arrested by FLPD for “resisting arrest without violence.” Elijah has been an early supporter of the Movement for Black lives here in Broward and deserves support in turn. It seems that right-wing, pro-Bruce Roberts interests in tomorrow’s election for the City of Fort Lauderdale have been seizing on, and perhaps even helped cause, Elijah’s arrest, as an attempt to insert a bit of last minute drama against the front-runner for Mayor, Dean Trantalis. Hit-pieces from Tom Lauder, aka “Red Broward” and “True Broward TV,” began early last week, using readily available online statements made by Elijah to paint him as some kind of social menace. On Wednesday, the door of a campaign office for Bruce Roberts was “slimed,” and according to Sun Sentinel reporter Brittany Wallman, the Roberts campaign began claiming that Elijah was responsible, leading to his arrest at home on Friday. Red Broward almost immediately made a self-congratulatory post celebrating Elijah’s arrest. Elijah was bailed out of jail the next day and has written several statements regarding this incident. 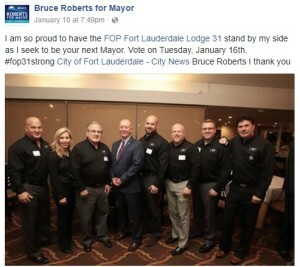 At this time it is worth repeating that Bruce Roberts is a past chief for the Fort Lauderdale Police Department and was endorsed by most of the City’s police unions. He is also the successor favored by current Fort Lauderdale Mayor Jack Seiler. Over the weekend, Fort Lauderdale residents began receiving robocalls smearing Elijah and the Trantalis campaign over this incident, and even the very same police unions that endorse Roberts seized on the “drama.” By Sunday, Trantalis appeared live on Channel 10 news to defend Elijah. It almost goes without saying that this is exactly the kind of racist, police-driven shenanigans that made the M4BL necessary. Elijah Manley’s behavior and credibility is not some kind of piece of election dirt that elderly white cops can use to bolster their unpopular candidacies. Bruce Roberts sat on that dais for years, unflinchingly going along with everything the City wanted, whether it was for bigger and bigger developments downtown, more dollars for FLPD, or even having BLM activists violently arrested inside City Hall. 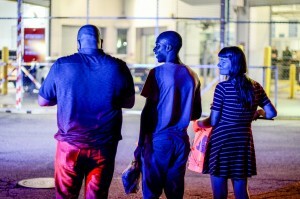 We stand with Elijah Manley against these bigoted, desperate attacks. Enjoy retirement, Bruce Roberts.